Peel and roughly chop the swede and sweet potatoes, then boil in a pan of water for 20 minutes, or until soft. Drain and leave to steam dry, then mash with butter and set aside. Finely chop the carrot and celery, then peel and finely chop the onion and garlic. Shred in the ham and turkey (if using cooked turkey), then add the stock. Pick in the sage leaves and leave it all to bubble for another 10 minutes. 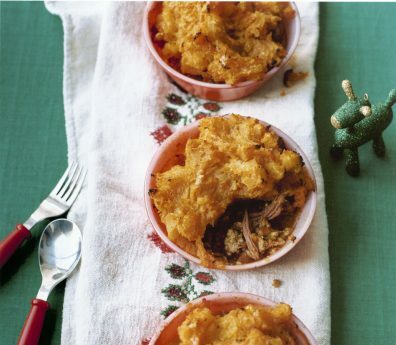 Spoon into little ovenproof dishes and top with the mash. Bake for 20 to 25 minutes, or until hot through and golden.